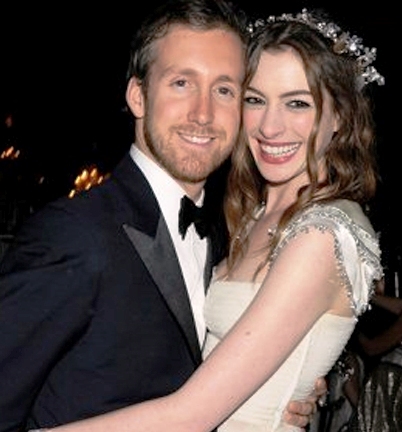 'Dark Knight Rises' actress Anne Hathaway's engagement party was "so fun"
The 'Dark Knight Rises' actress and fiance Adam Shulman threw a party in a New York book store to celebrate their impending nuptials - which are expected to take place in October 2013 - last month and delighted guests with the quirky celebration. Among the personal touches was a banquet of vegan food and decorations including bird-shaped vases filled with Anne's favorite flowers, ranunculus and anemones. A source told Us Weekly magazine: "Everything so was fun, just like Annie." Although pals revealed Anne and Adam have already selected a New York venue for their wedding, they are not planning to reveal where until the last minute. A source said: "But they're keeping it a secret until right before!" Anne and Adam - who started dating in 2008 following the actress' split from Raffaello Follieri after he pled guilty to 14 counts of money laundering, conspiracy and wire fraud - announced their engagement in November and Anne explained he "ruined" her plans to stay single. "I am very much in love with him, [only] Adam totally ruined my plan. I was really actually looking forward to a little alone time, and then I fell in love like a fool!